The first thing we lose is the mainmast. Mere minutes ago, Bossa’s Luke Williams and I had set sail from our home island in a fairly large galleon—where “set sail” here means “flew into the skies, steampunk-esque engines propelling us into the no-man’s-land gap between us and the next floating island.” Now, our beautiful ship had been buffeted by a storm that stretched miles across the horizon. Lacking a mast, we nevertheless pressed on. Next to go was the compass, making it impossible to navigate through the storm. Then we lost the secondary mast. Then all of the guns broke off and were lost to the tempest. It was my first time laying hands on Worlds Adrift, the studio’s upcoming MMO. I’d seen a fair amount of the game before and gotten an idea of what the I Am Bread and Surgeon Simulator team was aiming for—a more serious setting that was, nevertheless, dominated by physics simulations like Bossa’s other titles. Worlds Adrift is Bossa’s “mature” game, I said last time—and I stand by it. The game is made up of floating islands, dotting a vast and otherwise-empty sky. You harvest resources, build your own sky ship, and explore. Or join up with someone else. Or whatever you want, really. It’s exponentially more ambitious and freeform than the studio’s previous games, which relied mostly on gimmicks. And yet half an hour with the game and it also feels undoubtedly like a successor to the studio’s earlier work. Meaning it’s hilarious, despite its more serious trappings. Take, for instance, my efforts to mount a gun on the side of our ship. The gun is too heavy to lift normally, so I fastened a tiny anti-grav unit onto the side to help mitigate some of the weight. That done, I grapple-hooked my way atop our ship, fastened the rope to the gun, and pulled. The gun lurched into the air, flew towards me…and then slammed directly into the side of the ship, breaking bits of the siding off in the process. Meanwhile the gun ricocheted off in the opposite direction, tumbling through the air into the void. Or take our predicament above, where the entire ship fell apart in the middle of a tempest. Williams managed to keep his character alive for a bit, amidst the wind and lightning, and grapple-hooked a piece of our ship’s debris to him—a small piece of wood siding, probably big enough for Kate Winslet to float through the icy waters of the Atlantic. With no other means of survival, Williams put a bomb on the back-end of the wooden panel, blew it up, and hoped it would propel itself (with him attached) out of the storm. It didn’t, but it could have. In Worlds Adrift, everything is governed by the simulation, meaning with enough force and a proper sense of direction, that ol’ wooden panel could’ve been Williams’s salvation. I’m not much a fan of survival games, but what I’ve loved in the past is the emergent shenanigans that arise. DayZ, Rust, ARK—they’ve generated stories, just from throwing people together in an anonymous and semi-low-stakes environment and seeing what happens. 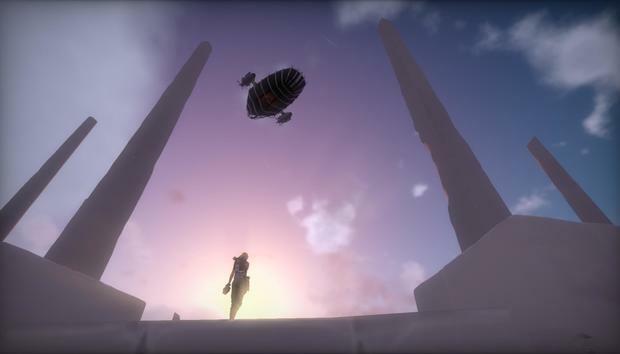 Worlds Adrift takes that framework and makes it smarter, more complex, more autonomous. There are dozens of systems, all waiting to be exploited by players. Hell, there’s even an ecosystem. We flew past a group of floating manta rays, and I was told that they were used for crafting materials and the population would slowly diminish over time. “Can they go extinct?” I asked. The answer: It would take a concerted effort by all the players probably, but sure, they could do it. That’s sort of fascinating, an MMO that gives players that much control. And it extends to other aspects of the game too. The game’s entire structure, really. Worlds Adrift is, as I said, made up of floating islands. Some are big, some are small, some are high, some are low, and they’re all (at least the ones I saw) created by players. This is EverQuest Next’s dream, realized. Bossa released an Island Creator tool on Steam, and players took to it. Every amphitheater, every ruin, every cave, every mountain range I saw was hand-crafted. It’s smart, really. Bossa’s not a huge team, but this is a huge game. Old-style MMOs (think World of Warcraft) need massive staffs working on content for years at a time—content the players then blow through in a month at most. Some others have relied on procedural generation, but inevitably you start to see the math, see the repetition and the computer at work. Worlds Adrift should see a steady stream of islands to expand the game, provided it’s necessary, and yet they all have that bespoke look to them. They’re all unique. It’s fascinating, and makes mindless exploration feel a lot more interesting than it might otherwise—helped, of course, by the fact grappling hooks are awesome and wingsuits are even cooler. And then there’s the ship creator, a tool I assumed must be coming but which Bossa officially showed off during my demo. Looking a bit like a spiffed-up Maya or Blender, you can now create a custom skeleton for your dream ship and fly it around. It’s bound to undermine the “Floating Pirate Ship” aesthetic Worlds Adrift was first marketed alongside, but who cares? You can make galleons, sure, but also space ships or flying dog heads or a floating skyscraper or—knowing the internet—a middle finger or...other appendages. I saw a few basic ships Bossa whipped up during its day of press demos, but I can already imagine the possibilities once the community gets ahold of these tools. And what I’m most excited about, and this dovetails with the community-generated islands, is it should make meeting other players interesting. Imagine running into a group of a hundred players, all living in some massive floating sky-city, or a Death Star or what have you. It’s a once-in-a-lifetime event, something that you’d never get from a more scripted game where every ship looks the same or at least like one out of a dozen different ship types. Point is, I’m excited for Worlds Adrift even though it mashes up two genres (MMO and survival) I typically don’t fall in love with. My demo had me laughing almost non-stop, whether I was lobbing cannonballs at flying mantas or being chased by the same flying mantas or throwing large naval guns into the air or swinging like Spider-Man through a cave 600 feet tall, dotted with ruins—which someone in the community built. I can’t wait to see what other surprises dot the skies.